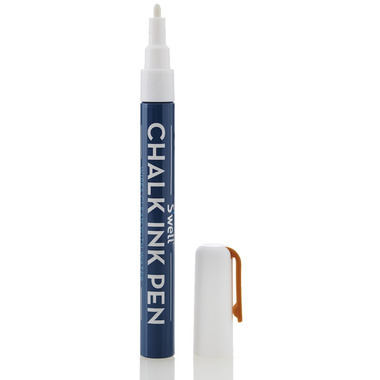 Unleash the inner artist in you with S’well Chalk Ink Pens. S'well Chalk Ink pen wipes clean with water for ongoing fun! Works nicely on all S’well bottle finishes! I love using these pens to write directly on containers of food that Iâ€™m going to freeze. That way I donâ€™t need to use labels and I can still write what it is and the date I froze it. I tried some other pens for this purpose and I like these better because the writing stays on well (after itâ€™s dried) and yet comes off easily with a quick wipe of a damp cloth when you need to change whatâ€™s written. These pens are perfect for the chaulk board labels that I purchased for my mason jar lids! Works well once it's gets going. Had to press pen on the bottle for 20-30 seconds before the writing was visible. This chalk pen works great. I've been using it on blackboard labels and it washes right off.